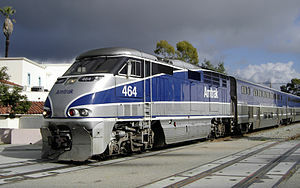 The F59PHI was designed for Amtrak California intercity service and began production in 1994. It is distinguished from the F59PH by its streamlined cab. A total of 83 F59PHIs were built between 1994–2001, primarily for commuter operators. This F59PHI project modeled after a local regional railroad NCDOT. It uses an EMD 710-12 cylinder prime mover and the project includes a custom NCDOT horn.